The owners of the Hazelton Lanes shopping centre, Yorkville's original high-end mall, are planning a major upgrade that could see the Avenue Road building gutted and extensively remodelled in the hope of attracting more upscale retailers to the neighbourhood. According to a series of architectural renderings released earlier this month, the dated brick split-level facade would be replaced by a two-storey glass box with room for a pair of retail outlets on the ground floor if new owners First Capital get their way. 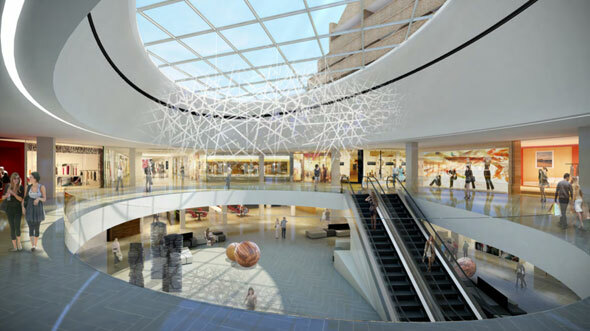 Inside, the existing atrium will get a brand new circular skylight and the floor-plan will be radically altered to accommodate a greater number of smaller stores. It appears from the drawings that the residential units will remain untouched, at least on the outside. Interestingly, the planned renovation of Hazelton Lanes seems to have been combined with separate proposal for the street corner just to the south. The latest drawings of 140 Yorkville Avenue show the shopping mall's new glass facade connecting seamlessly with a planned 35-storey condo. If approved, the tower will replace a cluster of converted Victorian homes on the corner of Avenue and Yorkville and add new retail of its own. The plans for Hazelton Lanes, which haven't been formally filed with the city, also call for the demolition of a building on Yorkville Avenue, currently home to a Subway restaurant and an art gallery, to make way for a new entrance and outdoor space. 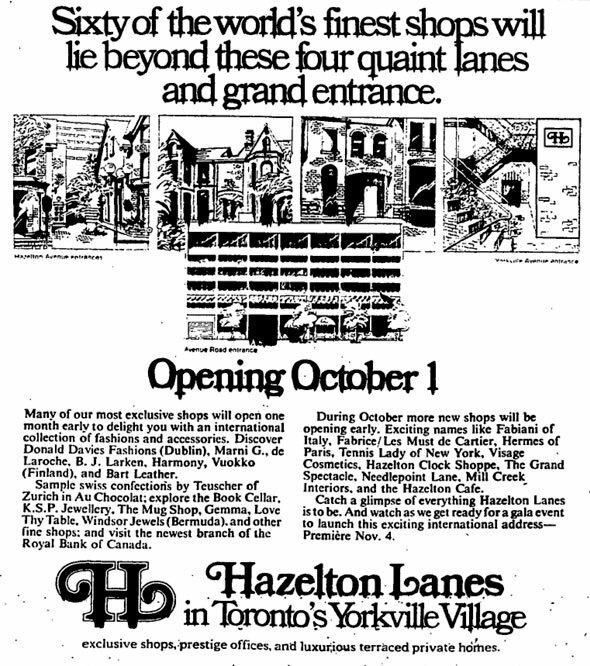 The original multi-million dollar Hazelton Lanes building opened in 1976, offering trendy boutique shopping beneath two low-rise luxury condominiums. A total of 57 residential units, which started at $72,000 ($283,000 in today's money,) were built in the staggered buildings between Avenue Rd. and Hazelton Ave.. The marketing material targeted CEOs of international businesses looking for a Toronto pied-Ă -terre. As if to illustrate the development's ritzy status, the Toronto Star reported with interest the sale of the most expensive unit, priced at an eye-opening $500,000 ($2 million in 2013 money,) when it was snapped up by an anonymous buyer seven months before the grand opening. The 465 square metre unit came with five baths (with European-style bidets,) three fireplaces, a conservatory, and sauna as standard, but the buyer and those interested in other units were encouraged to customize their homes during the building process. "A bachelor tenant asked if the shower could take three people," Richard Wookey, the developer responsible for the project, remarked in 1976. Before it was finished, Hazelton Lanes it had already overtaken the new Harbour Square on Queen's Quay as the toniest address in the city. The first retail tenants included Hermes, Visage Cosmetics, Roots, Windsor Jewels, and a Royal Bank branch, but the centre never seemed to quite live up to expectations. Today, U.S. supermarket Whole Foods is the anchor tenant. Yorkville has been through several sea changes in its history. Once a separate village, the area became the centre of Toronto's counter-culture scene in the 1960s, incubating talents like Neil Young, Joni Mitchell, Margaret Atwood, and Dennis Lee, before morphing a little awkwardly - Star writer Nicholaas Van Rijn called Yorkville "a tart decked out in finery above her station" in 1976 - in to the city's ritziest locale. If the list of planned developments is any guide, the biggest changes for Yorkville are still to come. Several new high-rise condominiums are planned for the blocks between Bay and Yonge, one of which could mean the loss of the CIBC tower. The arrival of the Four Seasons and loss of the Cumberland Cinema to a Nespresso boutique are just two of the apparently endless changes for the chameleonic neighbourhood. 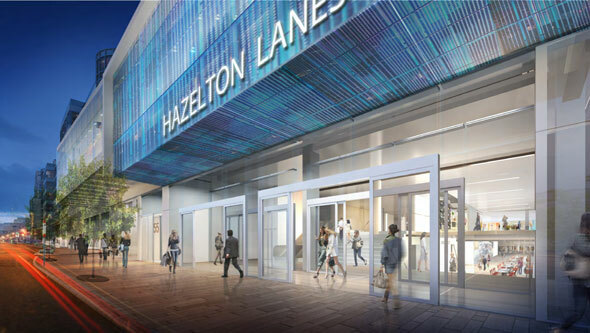 What do you think of the proposed new look for Hazelton Lanes? Is now an ideal time to make-over the aging shopping centre? Will new retailers be able to turn the business around?